special pricing for showroom model only. The CAV SOB B-012WSC - Sobra wine cooler - Small wine cabinet. The Sobra Line is NOT meant to be built in. These wine coolers do require air circulation around the cabinet. 5 inches of space is required on back, sides top. The Sobra line is available for shipping within the United States of America (USA) and Canada. 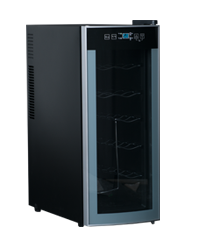 Features offered in the Thermoelectric Wine Coolers from 6 to 28 Bottles. 5 inches of clearance required behind and on either side of the unit. These units cannot be built in. These units are designed to be placed within a climate controlled room. They can only cool a maximum of 25 degrees lower than the ambient room temperature.